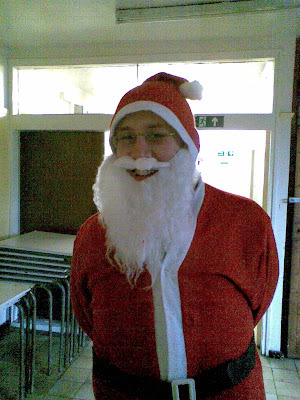 Santa says that's almost it for another year. Justin will be posting daily from Chrimbo Day itself with another Twelve Puzzles of Christmas. If you can't wait you could always have another go at last year's dozen. ... and the anonymous correspondent who told us about the video in the comments box to this post. And . . . that's it. What a great idea, though. Artists! More of this kind type of thing, please. And not necessarily battle scenes either. 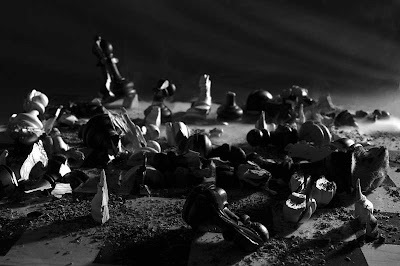 Say, how about chess pieces posing in the Last Supper, for starters? The White with purpose good, the Black with ill.
And I, half-pleased, half-puzzled, watched the game. If you haven't finished your Christmas shopping by now I think it's a probably fair to assume that at this point you're rather desperate. There's so much chess product to choose from and little more than a week to go. What to get that special chesser in your life? 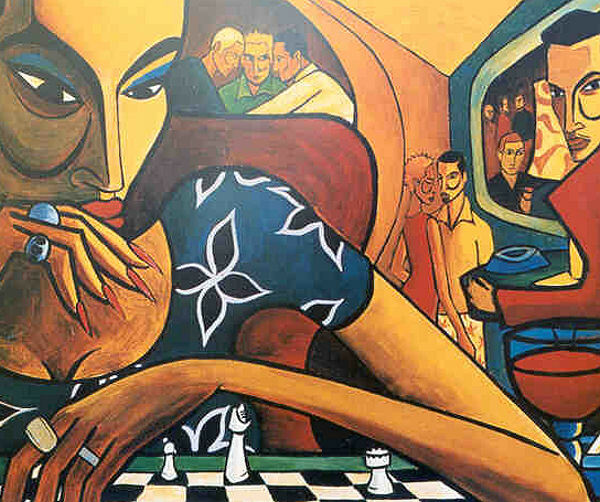 How about 100 of Raymondo's finest chess books? Not too pricey for the esteemed readership of this blog, I'm sure, but since we mentioned this collection as long ago as August they've probably already sold out don't you think? Perhaps the collected DVDs of Nigel Davies instead? A fine suggestion in many ways but I fear that even if the set does not break the bank the same is unlikely to be true of the floor of any room in which it is stored. It's a tricky decision isn't it? Tricky, that is, until you discover the Knight Light. 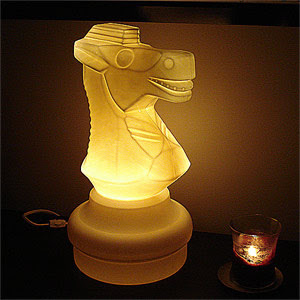 Here's a fun and functional item for the chess or horse lover. It's a Knight Light! This clever lamp adds a comforting glow to any bedroom, den, or game room. Just plug the 18in.-tall lamp in to any standard outlet, turn on the cord switch and enjoy. If the blurb and accompanying photographs haven't already got you reaching for your credit card then let me tell you that the Knight Light is "UL approved", whatever that means, and best of all the website flogging the thing makes clear it comes "Bulb included". Satisfaction guaranteed, I think you'll agree. : with thanks to an anonymous Atticus member for the tip-off. Well, did you get all excited about the London Chess Classic? 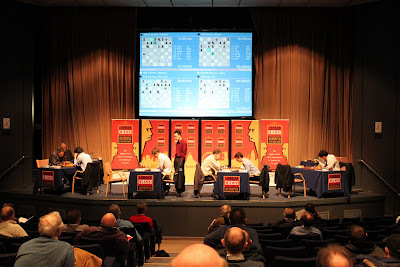 Everyone I know in London who's visited hasn't been disappointed, but for those unable to make it Streatham & Brixton Chess Club President Angus French has kindly sent in these photographs showing what it's like to be there in the audience, starting with the playing hall itself. Enjoy! A few of the players look really quite grumpy, whilst of the smiles Luke McShane has the biggest - an accurate reflection of how they feel after five rounds? Round 6 is today, the final round tomorrow. If you've missed the game so far you can catch up with them via the official site; Magnus Carlsen leads and looks odds-on to go home grinning. 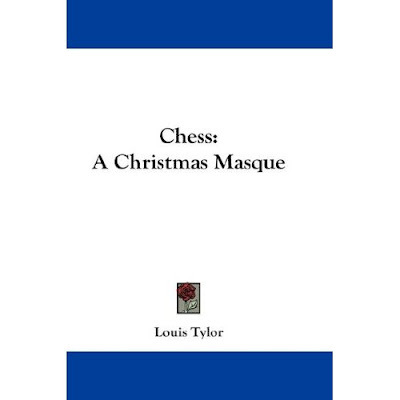 Chess in Art Postscript: Chess-in-Artists do for Christmas. 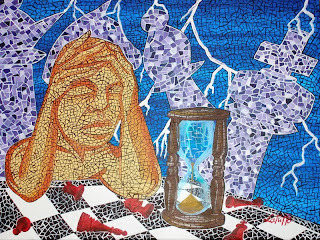 The Chess in Art series, and subsequent Postscripts, have shown Chess-in-Artists roaming hither and yon in search of fresh insights. So it is a warming seasonal sensation, like the first Harvey Wallbanger on Christmas day (best taken before breakfast) to discover that many of them applied their palettes to the Yuletide. Not something that readily springs to mind as a Chess in Art sub-genre, for sure, but it will do nicely as a tasty stocking filler for mere players like ourselves. As is the artists' privilege, they approach the matter sidelong in order to catch unawares the darker side of this shrilly trumpeted season of comfort and joy, comfort and joy, this season of comfort 'n joy. This should be no surprise, as with privilege comes duty. Thus it is the responsibility of the artist to reveal, lay bare, and provide for moral improvement, especially in rootless and troubled times. None of us enjoys losing, but this is going a bit far. Thankfully FIDE seems to have succeeded in stamping it out, along with those new-fangled mobile phones. By contrast, a few hundred years later, an Italian artist portrays the darker side of homely decorum and bliss. 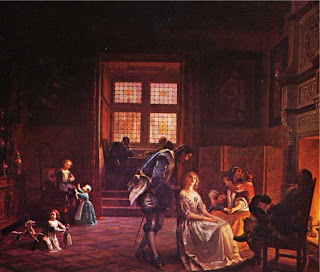 In his subtle composition Signor Beda shows that things are not as they appear on the serene surface, and that there are the tensions lurking behind the mask of domestic bonhommie, from which chess provides merciful relief. The warm glow from the hearth raises the temperature in the melodrama coming to a boil after several days a-stewing in the emotional pressure cooker of typical family Christmas (though refreshingly free, as it is, from the trappings of rampant commercialism of our modern times). There's trouble a-brewing as the two fellows compete for the attentions of the fair lady. Let's hope that she manages to avert fisticuffs (poor lass, but 'tis the season for parrying winter duel). Beyond, somewhat inappropriate fire-side canoodling leaves the coast clear for a posse of little darlings to squabble over their presents, and feed dolly to the dog. Wise old Father Christmas has legged it, and the chess players can hardly be blamed for making themselves scarce by the window. When the lid comes off they'll be hoping the mess doesn't dump on their board. So, it you are spending time en famille this Christmas good advice would be to get out your set, find a nice quiet corner, and while they are roasting the turkey hope they don't cook your goose. Analysing your adjourned positions on the office computer, in work-time, is asking for trouble, as we'd probably all agree. But at the annual Xmas bash, where one's colleagues do unlikely things that they regret for the rest of the year, a chess set could be a life-line. It might for example, provide a convenient pretext for a lady to rebuff the office Lothario, especially if he suggests slipping back to the deserted office to try his lap top (which, as double entendres go, is a trifle beside the compound innuendo dispensed by the late lamented Humphrey Lyttelton, a propos the lovely Samantha). Here is another cautionary tale, warning of an elephant trap that snares many an unwary office party reveller: too much cheap plonk on an empty stomach. It is the morning after the ill-advised excess of the night before, and day one of his year of remorse. There'll be no breakfast cocktail today. His head pounds, his colour drains, and our chess playing friend can't bear to open his eyes to set up the pieces. As the nausea rises before him, so does a nightmare recollection of his embarrassing deposit at the feet of his work mates. He is cracking up, and he is not laughing. In this exuberant confection of gorgeous curves the ample roly-poly minstrels, at one with their instruments, weave through and over the supporting grid. Their limbs dance across the frieze and make music as they go. We can almost hear their earthy carolling as it charms the birds from the trees; and the pieces dance along a jig. The image is laid out as a mosaic, and the rich blue, red and gold tessarae glow like baubles on a Christmas tree. 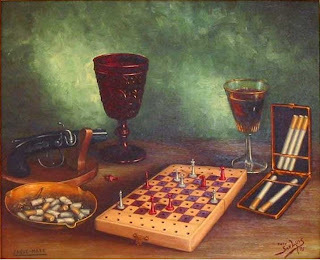 Chess-in-Artists may not have created their Chess-in-Art works deliberately with the festive season in mind, but this last one will serve very nicely as a Christmas card to all Chess in Art lovers. Season's Greetings and best chess wishes for 2010. Sixteen years, and what do you get? I last won a chess tournament in 1993. I won two that year, one a grading-limited thirty minute tournament in Cowley and the other, a little earlier in the year, the national HASSRA championship in Bedford. I never even won my class championship at school - Scholar's Mate did for me, would you believe - and it's not so easy to win your club championship when Harriet Hunt is a member. In fact, I believe the first of my 1993 triumphs constitutes the only normal-time-limit tournament I've ever won, and thus, to date - and quite likely, till the end of time - the last. I've won the occasional email tournament, but real, proper chess, cara a cara but with time to think - nothing. Not since 1993. I'm not the strongest player in Huesca province, but three times in a row I've been the strongest player in its individual championship. This autumn, when the 2009 championship was played over nine consecutive weekends, I was the strongest player by a margin of 150 points: if I was ever to win it, it was surely to be this year. The first round was as straightforward as can be - I won by default. I also won in the second round, a task complicated by the necessity to win inside three and a half hours in order to catch a night train across Spain to the small mining town where I was working the next morning. The target was achieved with about fifteen minutes to spare, the night train was caught...and so, the lack of sleep contributing, was a fever, which remained with me all week and into the next weekend. The third round, I played with a temperature, which shouldn't have prevented me winning for a third time. Faro Perella - Horton, Huesca Individual 2009, round three. 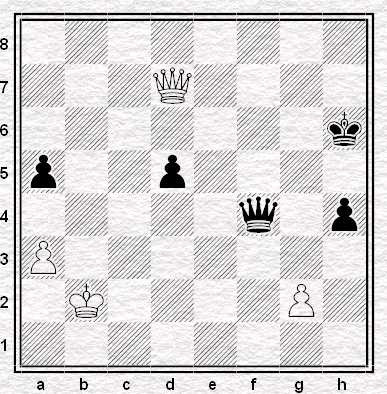 Position after 21...h7-h5 22.Ng4-h2. 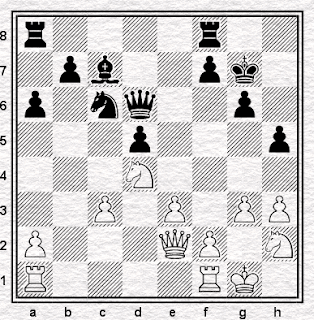 Black played 22...h4 and expected to win (and go back to bed) shortly: he was then surprised by 23.Qg4! which not only stays in the game but actually wins a pawn. 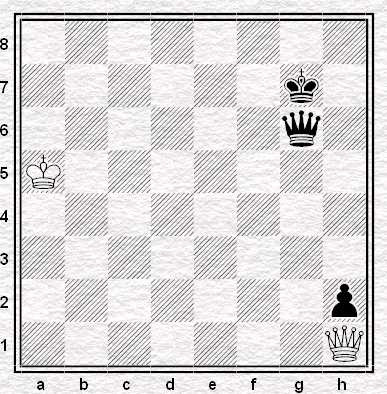 Black should have enough for it, but after 23...f5 24.Qxh4 he went badly wrong with 24...Nxd4? 25.Qxd4+ Rf6 and although White's 26.Qh4?! was far from best, Black lost his head trying to win instead of trying to hang on and fight another day. After 26...Rh8 27.Qb4 Qd7? 28.Rad1 Rxh3? 29.Qxb7 Rxh2? 30.Rxd5 it was all over, as was Black's weekend. He went back to bed with more than one kind of headache. 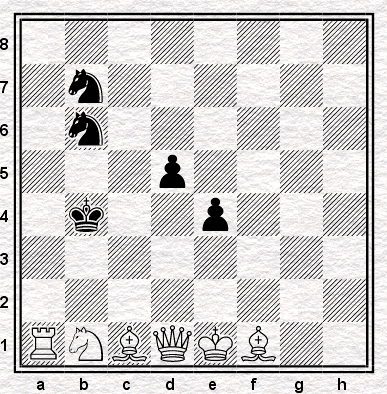 In the diagram position, Black has a simple win. You would still more than likely win a nine-round Swiss if you got to eight points (not to mention eight and a half, a point that Black might have liked to have kept in mind during the crisis of the previous game). 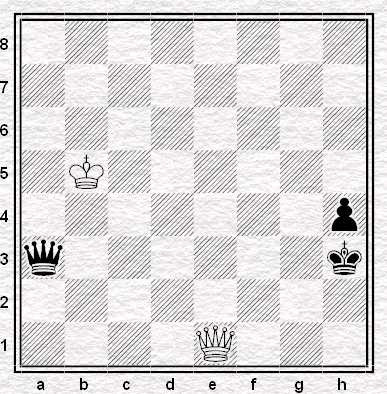 But winning six straight games under pressure is not so simple even with a very large rating advantage - albeit substantially simpler than without it - and although the fourth round was a straightforward win, I was incredibly lucky to get the required point in the fifth round, in which Black missed rather more wins than the one that White missed early on. Incredibly lucky - or perhaps not so, since if you use up enough luck in one single game, you're not really entitled to any more. In round six I played a young Huesca player, Pablo Bellosta, who I'd beaten relatively easily with the White pieces in the Aragón championships in August, having a large and stable advantage out of an opening I'd known better than he. Pablo had done some work since then, and although we were, nevertheless, soon in territory newer to him than me, it was a much more two-sided game than our previous. Horton - Bellosta López, Huesca Individual 2009, round six. Position after 18.Qf4. I had rather fancied this position and after 18...Bxe4 I passed up 19.dxc5 which didn't (and doesn't) look like anything for White after 19....Nxc5 20.Bxe4 Nxe4 (or 20....Qc7) 21.Qxe4 Qb7 and punted 19.Qxe4 instead, trusting on the queen's access to the eighth rank and the line-opening a4 to provide an attack. 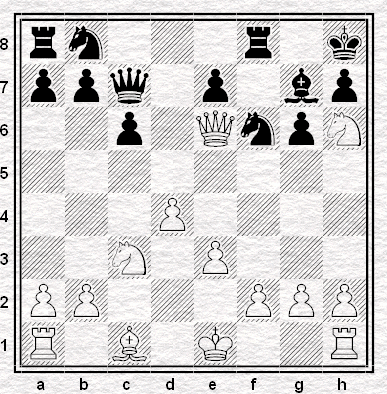 Alas, it was nonsense, and after 19...cxd4 20.a4 Nxf6 21.a5 Qc7 22.Qa8+ Kd7! 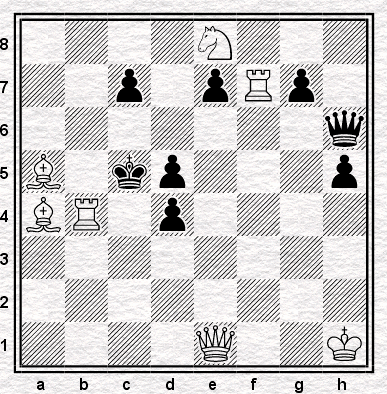 (the idea I had missed, although White has nothing after 22...Qb8 either) there were no open lines and no attack. 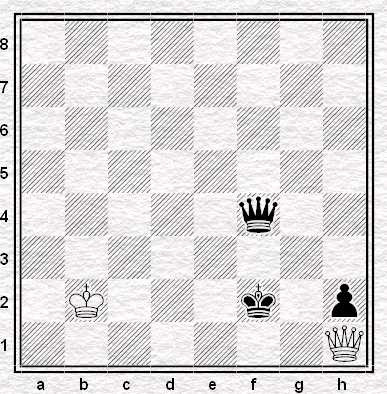 White was entirely lost. One error, but enough to lose the game without a struggle. Four out of six: and you surely won't win a nine-round Swiss with seven. Well, not from 4/6, anyway. I played grinding-chess in the last three rounds, won them all and finished on seven, my last game being the last game to finish. The eighth-round leader, who had had five points from six rounds and had won the next two, nervously watched my game, calculating possible tie-break results, having lost his last game when a draw would have won him the title. The second-placed player (my third round opponent) had lost as well and as it transpired, when I reached seven points out of nine, there were four of us on the same score. Here they have a system, one I quite like, where there are two possible tie-breaks and there is a draw at the end of the tournament to see which one should apply. The draw took place - my assumption being that my tie-break was far too bad for me to have any chance - and the computer calculated the outcome. ...showing that I had tied for first, on the selected tie-break. So the other system was applied, to break the continuing tie - and placed me second. Subcampeón, as they say here, but as far as I was concerned, a million miles from campeón. A million miles, or sixteen years. Sixteen years is a long time. Will I have to wait another sixteen until I win again? I was still only twenty-seven when I won that title. I am forty-four now. In another sixteen years, I shall be sixty. I have the scores of the games I played in 1993, although none of them are really worth seeing. But I keep them anyway, for old times' sake. Preserve your memories. They're all that's left to you. Three-part series presented by historian Benjamin Woolley about popular games in Britain from the Iron Age to the Information Age, in which he unravels how an apparently trivial pursuit is a rich and entertaining source of cultural and social history. In part one, Woolley investigates how the instinct to play games is both as universal and elemental as language itself and takes us from 1st-century Britain to the Victorian era. Dicing with Destiny was shown on BBC 4 last Monday but you'll be able to find it on i-player for a week or so (www.bbc.co.uk/iplayer/episode/b00p90d8/Games_Britannia_Dicing_with_Destiny/). The chess bit starts at around 50:05 and feel free to zip straight there if you feel that our game doesn't really deserve to be placed in the same category as Snakes and Ladders,Ludo and Nine Mens Morris - although if you do you'll miss some interesting stories, particularly regarding the origin of the former. 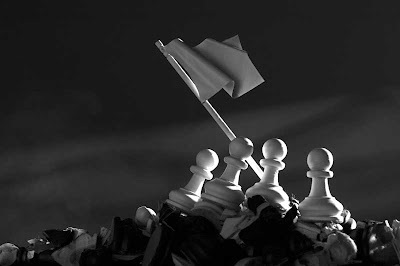 you'll find five minutes of Jonathan Rowson talking about the Staunton chess pieces, the London tournament of 1851, Anderssen - Kieseritsky, Fischer - Spassky, chess as cold war (or is it cold war as chess?) and the nature of chess intelligence. Bullet chess interviewing! 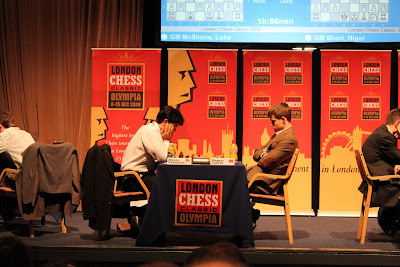 Excited about the London Chess Classic? 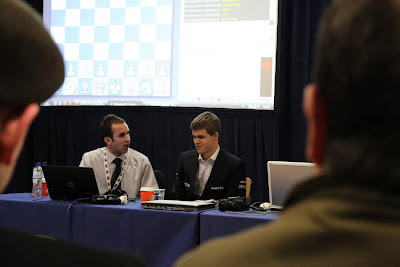 About Carlsen going for the +6 he needs to break even rating-wise, or whatever it is? Kasparov on the phone after each round? About a resurgent Short testing himself at the highest level again? About what David Howell might pull out of the hat? About Kramnik's repertoire - doesn't he even venture the odd 1.e4 against sub-2700s? And isn't Michael Adams one of those non-Super GMs now? Not to mention the side tournaments that range from blitzes to FIDE Opens? And, oh yeah, the Kortchnoi simul? What a punchy poster! And is it me, or does it more than vaguely resemble boxing adverts? Why not? 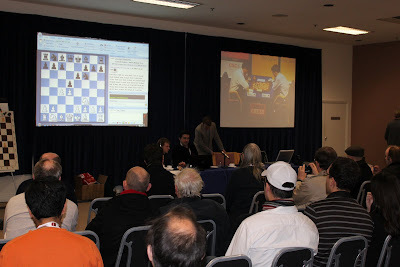 The Fight To Put Zaïre On The Map; The Fight To Bring Top Class Chess to Britain. That's the kind of thing we need. And hopefully the organizers will have learnt a few other tricks from boxing too. How about bikini-clad beauties displaying the number of each round as it begins, eliciting improbable grins from the blood-splattered faces in the front row? But what I'm really hoping for is a manic announcer hyping up the crowd as each contestant enters the ring stage, replete with wacky personal characterisations of the combatants. 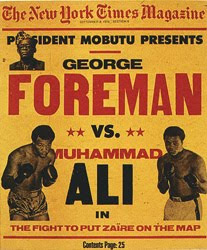 Google boxing nicknames, and you'll find they range from the banal - "Iron" Mike Tyson, "Big" George Foreman - to the brilliant: Andrew "Six Heads" Lewis, Juan "The Hispanic Causing Panic" Lazcano, "The Count of Monte Fisto". Which leads me, rather late in the post, to a question. What nicknames would you like to hear introduce the players tomorrow, as they strut onto the London stage for the first time? How about: Vladimir Kasparov Vanquisher Kramnik? Magnus Mega Champ Carlsen? Nigel Nine Sacs Short? You can do better. Do so in the comments. Fight! ejh's Chess in Art series finished about a year ago. 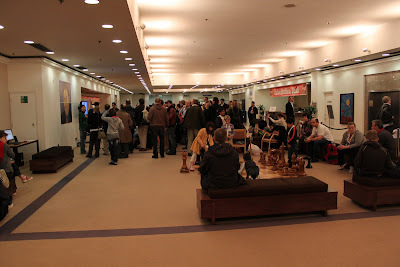 It treated us to a generous selection of chess art, but inevitably somethings weren't included – Still Life for example. And thank goodness for that would be a typical reaction. 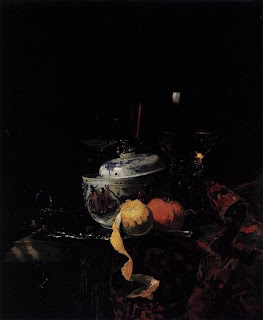 Still Life? Call a spade a spade as our Gallic friends do: nature mortes. Dead. Off the twig. Gone to join the choir invisible. The Académie Française consigned it to the fourth division of subject matter. Quite right, too. Dead nature and dead boring. Here's a case in point in which the picture expires before our very eyes. A few highlights peer from the gloom: a carelessly tilted crock; a raunched tapestry; and a half-peeled fruit shuffling off its mortal coil, destined for recycling. Here's another one, but with some chess this time. More modern perhaps (the filter tips are a giveaway), and more to look at, but that doesn't make it more successful. The objects plod around the canvas without a skip in their step, and the eye tags along behind without a focal point to stop and stare. And another thing: couldn't those ciggies (and the case itself come to that) set up a counterpoint diagonal in the other direction? Couldn’t the artist have risked more than a miserly two overlaps? Don’t you just crave another drink - something, anything, to bridge that gap in the centre? But maybe that is all beside the point. The artist isn't doing a still life, but a whodunnit. Look at those his-and-her glasses, one full, the other empty; the fag-ends (tipped for her, un-tipped for him) smoked drag for drag; the discarded piece doubling as a blood spurt under the barrel of what could be a lady’s weapon. The game is up. This is chess as a duel to the death. Check mate on the board and dead mate on the floor, and that's stone dead, not restin'. The elements are clustered, asymmetrical, untidy, overlapping, and positioned on either side of the demarcation line raked through the picture. 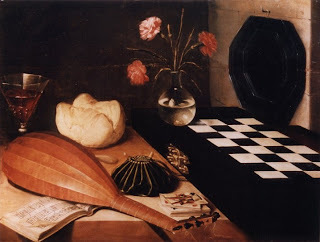 The chromatic action is on the table with a collection of meaning-laden bric-à-brac, while on the cabinet the black and white chess board calibrates the colours and tones. There is a treat in the rendering of the varied surfaces: reflective, granular, patinated, polished, satin, even transparent. 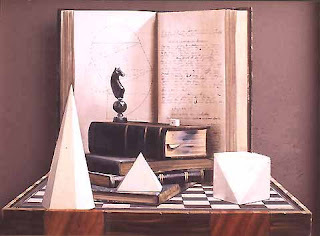 The bits and pieces to the left represent the five senses (as the picture's subtitle has it, according to some sources), whereas the chess board, at a guess, stands for the higher intellect savouring and refining what is available. It presents itself as a cartographic scale that measures and assesses true values. The board and platter are joined only by carnations, emblems of carnal pleasure and its inevitable decay, and together they make a commentary from beyond the divide. The message is that mortal flesh and its capacities are short-lived: so ponder while you may what you'll leave behind when you go (and there'll be no chess on the other side). It is a carefully centred arrangement with warm points of colour in orbit in a luminous space. 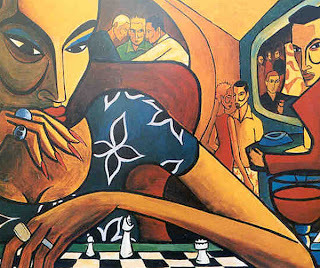 Once again a board is the chess motif of choice, and it multitasks: its rigid linearity is a foil for the softer surfaces and curves in the design, and makes a call that other right-angles echo; its darks and lights (modulated by a cast shadow) define the tonal range; and its narrative function is to evoke the absent friend represented only by stolen images – the photograph and bas-relief. This is a shrine, with mementos of someone recently departed arranged as on an alter. A significant other perhaps; but they'll play chess together no more. 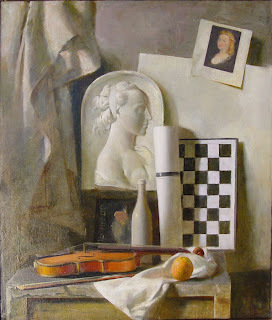 An obsession with borrowed time seems to be the cheery lot of the still life artist. 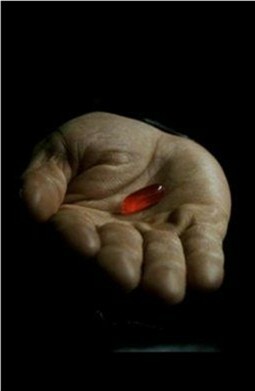 Here today and gone tomorrow is the message: life stilled. Here a black knight/dark night pun suggests familiar territory, but maybe this one is on a different tack. It is not about the nature of being (life, experience, relationships - that sort of thing), but the nature of Being (what's it all about; what underlies reality - what sort of thing are things, sort of thing). The artist is on a tack alright, brass tacks, he wants to get down and metaphysical. First off there are the alabaster solids: the one on the left has a pentagram (5 sided) base, there's a pyramid (4-sided) in the middle, both of which have, allegedly, harmonious properties, and the bit missing from the cube on the right would be, yes, a 3-sided form. Next up, behind the knight is what looks like an effort at a construction diagram for a golden section and indeed that is where the piece sits within the rectangle of the picture frame. Then the disposition of the books (the top one exactly as deep as the three upon which it rests) isn't accidental, they have a happy congruence with the vertical halfway line of the picture, which divides the ten (no mistake) squares of the board into two lots of five, numbers that crop up in the formula for the golden mean, where 1.61803...is given by the square root of 5, plus one, all divided by 2. Solnon is alluding, it seems, to the hidden order beneath the surface chaos, to the principles governing the contingent; and in the here and now, the inherent not the hereafter. Perhaps there is more to nature mortes than meets the eye, and we should give it the time of day. Not dead, Major, just restin'. And to prove the point have a look at this little display of discreet good taste, the fruits of privilege, set like pearls on velvet. "Rejoice, for issue number 40 of Kingpin is out ...."
Or so said my friend and fellow blogger EJH a couple of Fridays ago, although not that out as it transpired. In the week that followed I visited both branches of Chess and Bridge only to find that they were yet to receive any supplies from the publisher. Fortunately when I went back to Baker Street this Tuesday I finally got my mitts on a copy. I had a good read, enjoyed it immensely, then got on with my life. Shocked is scarcely the word for my reaction to issue 40 of Kingpin magazine. 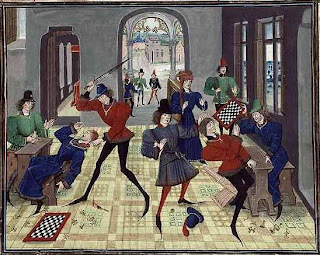 Reading the detailed article about Ray Keene, "Machiavelli on Ice", anyone would conclude that such a man merits no place at all in the chess world. It was bad enough when the previous issue uncharitably put Ray's writing under the spotlight for 15 pages, together with some dark hints about his financial dealings. There should be a law against such things. And now 13 more pages about what supposedly happened to investors' millions, and another unseemly charge of plagiarism, as if anybody cared. The heading contains a word not even in my dictionary, "Grandfraudster", and I regard this shambles with total disgust. Nobody's interested in such exposés, however much "documentary evidence" Kingpin finds to put on its website http://www.kingpinchess.net/category/penguin-files/. 1) Tell the Editor of Kingpin what he can do with copies of his magazine. The address is: kingpinchess@yahoo.com. 2) Write to the Editors of The Times and The Spectator, expressing dismay at the precise accusations against their chess correspondent and telling them they look ridiculous. 3) Send congratulatory messages to the British Chess Magazine and CHESS for steadfastly defending Ray's interests, by omission and/or commission. 4) Persuade leading officials of the English Chess Federation to make Ray the Finance Director, with unfettered powers. 5) Swamp chessgames.com with messages summarizing the attacks on him, so that Ray can respond at a safe site where, mercifully, there are still people who look up to him. Please act now because Ray really needs help. We thank Mr./Ms. Eddis Foster for his/her letter and take the liberty of providing some links that may prove useful to our readers. 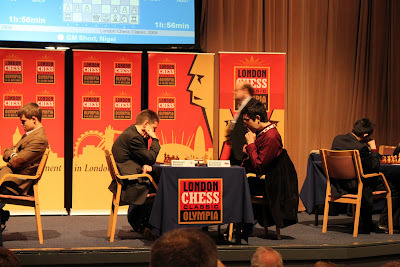 There are two chess tournaments taking place in London. 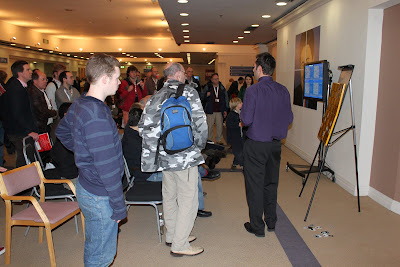 If you turn up at the first, let’s say it’s at Simpson’s-in-the-Strand, you’ll find the playing hall to be a slightly cramped, not spectacularly well lit room while the demo boards are small, as far away from the spectators as they could possibly be and not always kept up to date. There is no Grandmaster commentary but if you were to wander into the bar area there may or may not be a computer screen displaying what may or may not be a game you’re interested in and you may or may not overhear a visiting GM, Spess, Conquest, Jon Levitt for example, giving an opinion on the state of play*. - but it’s free to get in. - but admission will cost you £15 a day. Alas, you only have time to visit one. If we assume your journey time would be the same for each tournament, which one are you going to go to? 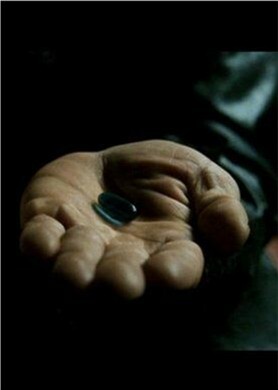 Which one for choice here? At first blush from the neighbouring board, this looked like a relatively ordinary if slightly awkward position - until I realised that the routine 10... e6 loses a piece to 11. f3, because the bishop will soon be trapped. What is black to do? One way or another, he is going to lose at least a pawn for nothing, and a significant pawn at that. I had the wacky thought that maybe 10... Nd5 was playable, sacrificing a different pawn to ease the pressure through exchanges, not noticing that 11. Nxg4 nets a piece for nothing. But you can make that kind of casual mistake when looking at other people's games, it doesn't matter. What matters is what the player himself does. My team-mate B was a reasonably strong player and I felt confident he would find a way to make a battle out of it. And when he played 10... Be6, Chivers on the neighbouring board felt impressed by the audacity of the trap he was setting: seeing if his elderly opponent would blunder into the smothered mate that was not there. And lo, an unthinking white casually obliged with 11. Bxe6 fxe6 12. Qxe6+ Kh8 13. Nf7+ Kg8 14. 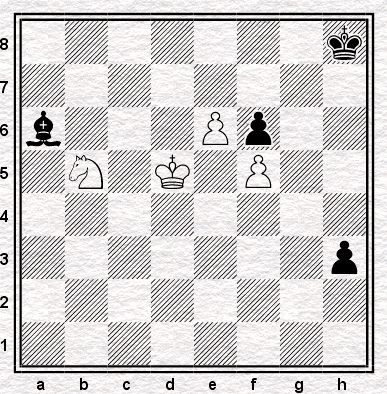 Nh6+ Kh8, and after a few happy moments of, presumably, internal celebration here . . .
. . . he wafted his queen to her deathbed on g8. Yes, 15. Qg8+ was really played. 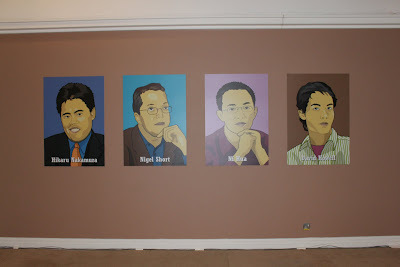 But if only this story of the board beside me ended there. At this point, I was now watching from behind B, and was completely elated. An early victory for my team mate! What a brilliant piece of psychology! Our team were firm favourites now to take the match, too! Player A, meanwhile, had wandered off, looking contented, deciding no doubt that the polite thing to do was to give Player B a few minutes at the board to compose himself before resignation. The egg that would be on A's face, when he returned to find the knight on g8! I walked around to the side of the board to watch B crown his fine coup with 15... Nxg8. I watched Player B sit there, smiling away, savouring the moment. Then his hand reached out - but for the rook. My eyes ejected themselves out of my face with a hooting noise, like in cartoons. B retracted his hand. Ah! I thought, a moment's comedy for the spectators. The bluff that he was going to capture with the rook! Haha! Pints and chortles all round after this, surely. 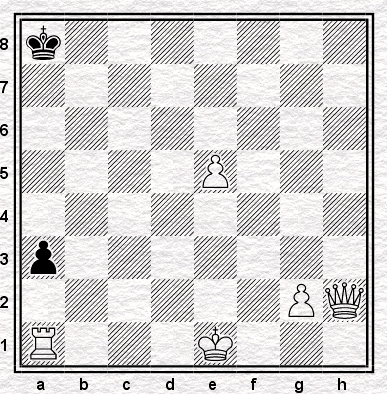 And then out B's hand came again, and 15... Rxg8 indeed was played, and mate duly followed on the next move with 16. Nf7#. Soon B realised his mistake, since the reaction of the spectators must have alerted him to the fact something unusual had happened. I was too devastated at this point to pay much attention, but I believe he communicated something about knight not rook to his opponent, which A construed to mean that 13... Rxf7 should have been played. I don't know. Back to my game I went, thinking only about the board beside me. Which British International Master has the middle name Roland? Which British Grandmaster has the middle name Curtis? 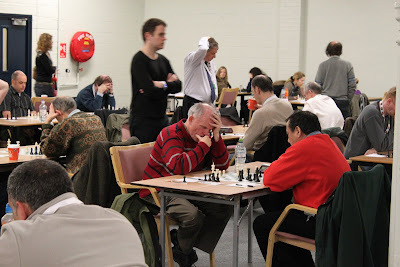 Which British Grandmaster has the first name Harold, but uses his middle name instead? We're already reaching the end of our Arkell Interview. In Part I we heard from Keith about his life in chess and Part II covered his playing style and the chess press. Today to conclude, appropriately enough, we have Keith Arkell on the endgame. As ever, this is me and everything else will be Keith's own words. Not long before Keith agreed to chat with us I’d played an email game where I stumbled into defending a KR v KRB ending. Although I didn’t have the slightest clue how to play these positions I did at least know that for the most part such positions are theoretically drawn. Necessity being the mother of getting off my lazy arse, I settled down for some endgame study – and one of the first things I learned was that theoretical draw notwithstanding, Keith wins this endgame time and again. … yes it's true. I have won the ending of R+B v R 17/17 times, but I have yet to play it against a GM; although I have beaten IM Lawrence Cooper in it twice. When I mentioned Keith's response to my fellow bloggers EJH immediately responded that getting KRB v KR on the board 17 times in a single lifetime is almost as impressive an achievement as going on to win every one of those games. He inspired me to ask a question that otherwise simply wouldn’t have occurred to me - how does Keith get the ending so much more frequently than everybody else? I've wondered that myself. I guess that the chances are increased because I am not averse to exchanging pieces in order to maintain or play for an edge. Rather a lot of my 6000 games have wound up in an endgame. 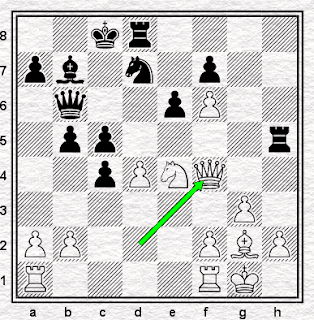 The crucial explanation may be this though: it became clear during many of my post mortems that both my opponent and I were playing for the same ending - R+B v R! This was certainly the case for example in both of the games against Lawrence Cooper, and the games v Gayson, Lewyk and Daly. To my eyes that answer makes Keith’s perfect record in KRB v KR even more remarkable. Not only is he cocking a snook at theoretical evaluations he’s also managing to outplay his opponents in positions they are deliberately heading for, hoping (expecting?) to be able to secure the draw. How is that possible? I can understand a GM notching some positive results against weaker (relatively speaking) opponents through sheer persistence but to do so as often as Keith manages it? How to explain that? Keith began by talking how he developed his taste for endgames in general. As far as I can remember, I first began to realise that I enjoyed playing, and had a good feel for positions in which there are only a handful of pieces on the board, when I managed to win the ending of B+N v N+P against England International Carey Groves at Jersey in 1985. 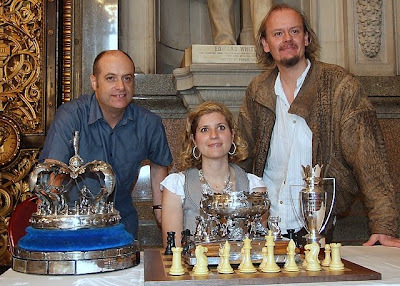 I do also recall though that when I won an ending of two Bishops v B+N with a few pawns on the board a couple of years earlier against a player called Zak rated 2310, Jim Plaskett said to me afterwards “Arkell, you would be an IM easily if you didn't play so many stupid games”. A typical Jim comment! However, it was during the game against Panzer at Hastings 1990 that I discovered I had an ability to accurately calculate long variations in simplified endings. 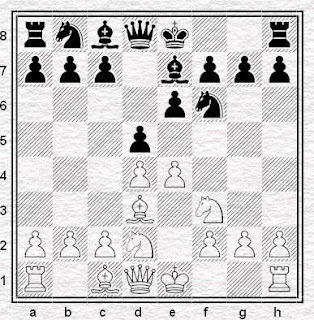 When I started outplaying strong GMs from these types of endings I began to realise that this kind of thing really was my chess strength, and compensated me for a lack of interest in opening theory, and having no special skills in using or defending against the initiative, and also my aversion to incalculably complicated positions. At the Watson Farley Williams Grandmaster tournament in 1991, I played indifferently in the openings and middlegames, but won a very nice ending of R+R+g pawn v R+R v Mihai Suba, beat Danny King in an ending with R+3 pawns each, and also beat Robert Byrne with my R+B+ h pawn v his R+g+h pawns. There was a moment in that last ending when he turned down the chance to defend R+B v R, and later remarked that he invented the “2nd rank defence”, and would have drawn easily had he chosen to! 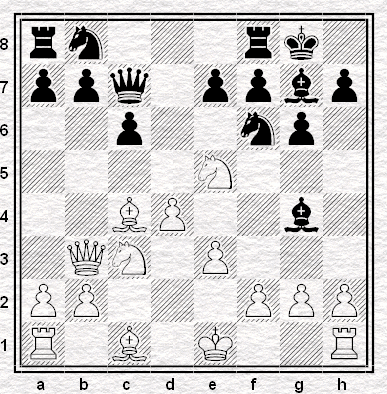 Then there was the game against Tony Kosten in Montpellier 2002 which I won with R+B v R+N without pawns! I saw some long and pretty variations in this endgame, one of which was about 15 moves deep; although again there were moments when he could have tried to defend a difficult R+B v R position, but instead went down my main line, in which my Rook won against his Knight. A long list of Arkell endgame greatest hits. Before talking with Keith I had assumed that these battles must have been the consequence of, or possibly the inspiration for, studying this phase of the game so deeply that he had theoretical positions, particularly KRB v KR, dripping out of his ears. As it turns out, that’s not the case at all. Recently I was looking at R+B v R with Jonathan Hawkins, and it became clear that he was better versed than me in some of the very long and precise winning variations. I am also often not sure whether I am in a drawn or a won position, but I calculate very well when there is reduced material, and have a good feel for how to improve my position. I have even wondered whether this for me is a kind of chess autism. What I mean is that typical autism traits include repetitive behaviour and a strong preference for a familiar environment. 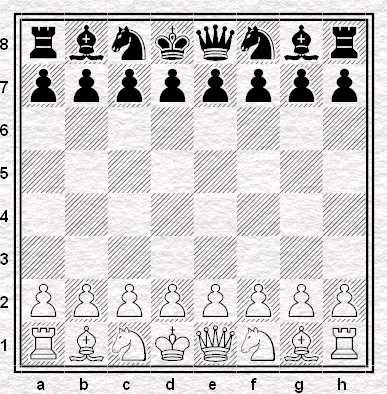 Chess itself is in any case attractive to people with autism spectrum Disorders (such as Aspergers syndrome) because of its well defined rules and familiar patterns, but these simple endings take the principle even further, and remove a lot of the uncertainty and randomness associated with complex middlegame positions. Though just speculation, it may well be that my skill in these simple endings was triggered by a liking for them on an emotional level – i.e. by what I'm terming “chess autism”. So it's back once again to Keith's approach at the board. Remembering his comments about his proposed endgame book (see bottom of Part I) this probably shouldn't have surprised me. I recalled a passage from Excelling at Chess - Aagaard has been looking at a number of examples of Ulf Andersson's endgame play then says, "Andersson does not do anything special at any time, nor does he show skills which cannot be understood. But every move is good - not great, just good. This is the skill one should aim for when studying the endgame." Did that sum up what Keith was trying to do when he's got R+B v R (or any other kind of ending come to that)? Yes, I just try to make progress and present my opponent with practical problems to solve. Of course, there are some winning positions and some drawing positions that I recognise, but in general it is about trying to increase my advantage until my opponent can no longer defend. 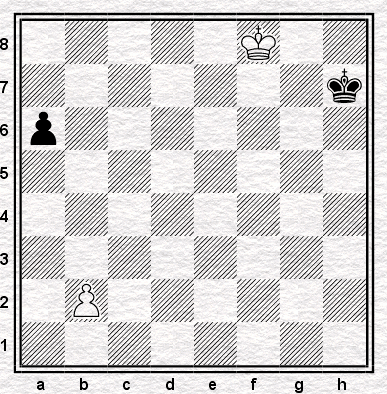 This is both in general endgame play, and specifically in R+B v R. Even in such a simplified ending as this there are plenty of opportunities to just play chess and hope to play better than your opponent. Only computers can see everything in such endings. I've played alongside Ulf in team events, and he once told me that he just tries to avoid mistakes, but this, together with Aagaard's simple descriptions of the way he plays belies his deep understanding of chess. I think it's too simplistic to say that he doesn't do anything special, and his skills are easily understood. For a start he knows way in advance exactly where he would like to put his pieces, and which ones he would like to exchange. Ulf very often makes progress in the endgame with finely tuned precision. All of this looks deceptively easy IN RETROSPECT for the very reason that that it all fits so logically and artistically, but to fully reproduce an Andersson game would require his level of understanding. And there our interview with a Grandmaster ends. Thanks to all my fellow bloggers for assistance in the preparation of these posts. Most of all, many thanks to Keith for his time and sharing his thoughts with us. We're continuing with Arkell Interview week today. If you haven't already seen it you might want to take a peek at Part I before reading on. As before, this will be me, and this is GM Keith Arkell. Put snooker or darts on TV and even the uninitiated will soon pick up what is going on. 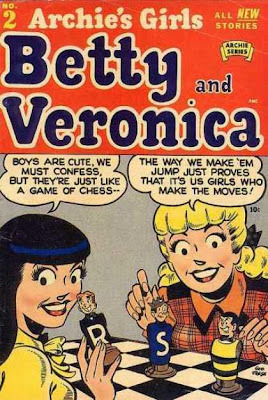 With chess this isn't the case. The esoteric nature of the game precludes the novice spectator from having a clue what is going on until he or she has put in many months, if not years of application. A chess columnist, and a chess magazine editor to a somewhat lesser extent, has the task of breaking down that barrier. It is therefore natural for him to publish violent and spectacular games, which are easy to explain. Of course these are not usually the best games, but the best games often have their own esoteric nature, hidden even from the majority of experienced players. I don’t think Keith is complaining here, just outlining the realities of chess journalism from his point of view. Evidently he can empathise with anybody who’d ever tried to explain “… the esoteric nature of chess to the layman, and the esoteric nature of certain strategic methods even to experienced players” as he puts it. I made an entirely tongue in cheek posting on the English Chess Forum, the piece later also appearing in Chandler's Corner. I suggested that I just wait around doing nothing, and then when my opponent gets jittery, because he “wrongly” believes that I am gaining imperceptible advantages, he lashes out somewhere; and only then comes the “sting”, and I quash his premature foray. I am simply shocked by how many people have taken this at least semi-seriously! It makes me realise that often I can be sitting there pleased with how my position is progressing, feeling like I am slowly creating something palpable, and yet meanwhile lots of players, and even some strong ones, just think I'm doing nothing except waiting for a mistake or time-trouble! This seems like the perfect moment to talk about Keith’s style of play. Not long ago we featured two of his wins against David Eggleston from recent British Championships (2008, 2009). Is it the difficulty that many players have understanding the nuances of those kind of games (myself included – I like them but I don’t claim a full grasp of what’s going on) that generates the criticism of his approach? Up until the turn of the century I played regularly in weekend tournaments, and paid little attention to my ELO rating. Because of my preference for keeping a tight reign on my games, and grinding out riskless wins, I more or less brought on myself the label “boring, mediocre, weekend tournament playing GM”. As a junior I used to play through hundreds of games. 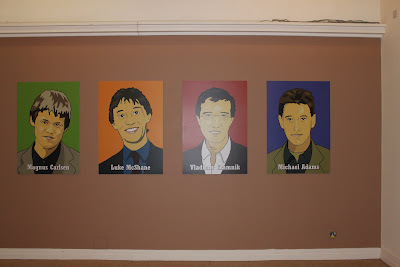 The games I particularly enjoyed were the long exacting wins by players such as Ulf Andersson and Karpov. This for me was the highest form of art in chess, and requiring great precision, as I found out to my cost this last August when my own grinding came so unstuck due to the lack of attention to details brought on by my health related poor quality sleep which I referred to earlier. As I slowly set about developing this grinding style in my own games, it honestly never occurred to me - not for many years - that the majority of players don't share my enthusiasm, and even find it boring. The “boring weekend tournament player” label really did stick, and still does to some extent. In January this year one of the 8(!) national team selectors said to me “you need to start winning international tournaments if you want to be selected to represent England”. I didn't bother replying that I had just won 5 internationals in 5 months (English Championship, Paignton, Blackstone, Wellington College and the Empire State International Open); and another of the 8(!) wrote on Chesspublishing.com, “In the British Championships Keith Arkell caused quite a surprise by finishing equal first”. Yes, “quite a surprise” if you don't get my style of play, didn't notice that it was only my 4th best performance of the year, and were oblivious of the fact that I nearly won the previous time that I played. These last remarks from Keith reminded me of a comment in Chess for Tigers where Simon Webb talks of feeling that the selectors of junior teams underestimated him because of the apparent simplicity of his play. CfT was originally published in 1978 – plus ca change! 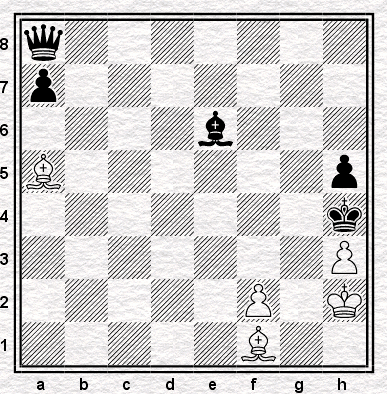 I lost a poor game against Ivanchuk and it got published in the Telegraph. One year later I won a similar length, but far higher quality game against Gawain from the same opening. This was by far the most important game of the 2008 British Championship, and yet I defy anyone to show me a single newspaper column which published this game. And let’s take my endgames. Pretty much ignored until I defend a bishop v knight position poorly against French superstar Vachier-Lagrave in the EU Championships at Liverpool in 2008. 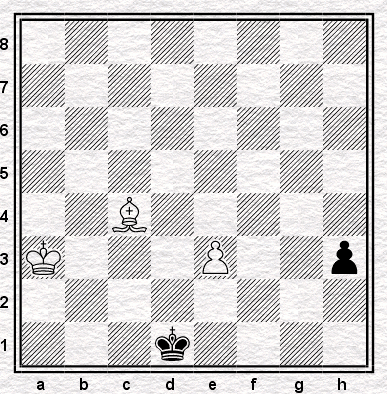 Admittedly there was an interesting study-like draw, which I failed to find due to time pressure, but given that the endgame is my speciality, where is the balance? And finally, what happens when I do play so called brilliant sacrificial games? Well, I left pieces en prise here there and everywhere against Stewart Haslinger in the 2005 4NCL. 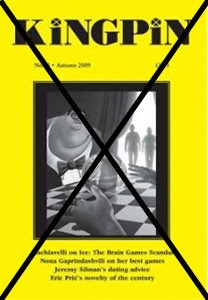 Perhaps when Andrew Greet did his report with games for CHESS magazine he was oblivious of this game? Perhaps, with so many games to sift through, this one somehow slipped the net? Think again, because Andrew was sat at the next board to me! On the other hand, he definitely wasn't sitting next to me in the last round of the 2009 British Championship, when I was feeling completely out of sorts and lost a lousy game against Peter Constantinou in which I played like a 150. No, sorry, that's insulting 150s - I played far worse than that. But anyway you've guessed it- he certainly made sure to annotate that one for the magazine. 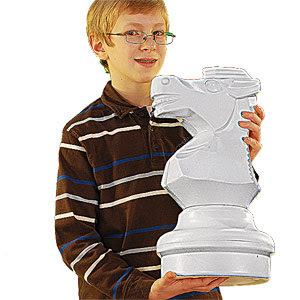 But before you feel too sorry for me, I did actually once have my photo on the front page of CHESS magazine. Well ok I'm exaggerating slightly, but the sleeve of my jumper made it there in any case. It was about 1987 and the main photo was of my opponent, Judit Polgar. I don't think that there is any personal reason for my bad chess press. 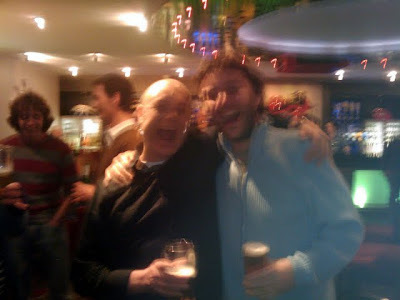 I have perfectly good relations with most chess journalists, and for the most part they are not hostile people. I think it is simply due to this tag I carry around with me, and which they fail to see beyond. I won't bore you with 20 years of examples, but just sticking with the British Championship of 2008, we had John Henderson writing "In one of the most open (and weakest of the modern era) British Championship at St. George's Hall in Liverpool, the title went to the wire and the inevitability of a tie for first place”. Err no John not “one of the weakest” - not with 12 GMs playing! Jonathan Speelman wrote “Arkell somewhat unexpectedly beat the top seed Gawain Jones”. Again no! Gawain and myself were closely enough matched that none of the 3 possible results would have been unexpected. Finally, Barden managed to avoid mentioning my name at all in his Guardian updates on the Championship, and Pein managed likewise in his CHESS magazine editorial on the event, and compounded this by writing that it “is a little more representative than last year with David Howell heading the field”, and later wrote that the chess in 2009 was higher quality. No Malcolm! It was more tactical yes, but not higher quality; and I'm not sure that losing Haslinger, B.Lalic, Flear, Davies and N.Pert in exchange for Howell, Summerscale and Wells really makes the event more representative, despite the rating of Howell. This sparked another memory – Ritson Morry’s BCM report of the 1971 British Championship in Blackpool that managed to avoid mentioning that Ray Keene had won! I’m sure it’s not a coincidence that Raymondo, with the White pieces at least, had a style somewhat similar to Arkell and Webb. Judging from these recent comments it seems that his play also sometimes fails to receive the appreciation it might deserve. Choosing something else at random, I'm not sure why Barden felt the need to describe my 2002 Grand Prix victory as lucky in the Guardian, and follow this up with this description of my Hastings Premier debut, in a field full of super GMs “Contrasting styles took the honours at Hastings, where Denmark's Peter Nielsen won with 6/9 and only two draws, half a point ahead of Keith Arkell who had only two decisive results. [Another similarity? Ray Keene often went through tournaments with a large number of draws and very few or no losses - JMGB] Arkell, making his Premier debut at age 42, rode his luck with the pragmatic approach which has served him well on the grand prix weekend circuit”. Rode my luck! Where? Which games? In truth I had bad luck not good luck, in that I carelessly agreed to a draw in a totally winning position against Harikrishna in response to his illegal draw offer! Finishing on a concrete example, perhaps the most (in)famous example of Keith taking a kicking in the press was after the last round at the British Championship in Scarborough 2001. He’d agreed a draw with Black against Gallagher who therefore won the title. Had Keith gone on to win he would, as it turned out, have become champion himself. At the time Nigel Short had plenty to say about it. After nearly a decade to reflect on what happened I wondered if Keith had any regrets or would he do the same again? This question is too difficult for a straightforward answer. I mean if you completely duplicated the circumstances, but gave me hindsight then I would have the extra information that all of the other games were drawn. There were essentially two factors which lead me to accept Joe's draw offer: Firstly my prize would cover my mother's and my expenses for two weeks (there were no fees that year, and I wasn't exactly rolling in it); but really far more relevant was the fact that I was feeling very uneasy at the board. Between the ages of about 17 and 40 I suffered from intermittent panic attacks (they seemed to disappear after that thank goodness). Journalists were too busy making up stories that my mother had travelled from Worcester especially to watch my last round game to bother asking me for the true facts. Apart from BCM that is. In Feb 2002 they interviewed me, and if you look on page 99 I made the prophetic comment “Perhaps next year I'll arrive at the 11th round with a 6th White rather than a 6th Black. Well 'next year' became 2008, because I didn't play during the intervening years. I played in 2008 with the attitude of playing out every game. This worked to my advantage when draws were being agreed all around me in the last round. Thanks once again to Keith for the chat. Keith Arkell on the endgame.